At Soft-ex we assist Digital Service Providers (DSPs) to enhance customer experience and reduce billing and customer care costs with interactive billing communications and analytics solutions. Our solutions deliver tangible results by consolidating and leveraging existing billing and CRM systems. You don’t need to replace them, we seamlessly integrate with them to deliver that all important touchpoint of billing communication to your customers. Customers can view and analyze their bills online via our advanced self-serve UX (User Experience) portal 24/7. Customers like to feel that you care about them and their business and so if you can personalize and simplify the whole billing experience, it will make customers more loyal and less likely to churn. Remember it costs a lot more to win a new customer than to hold onto an existing customer. 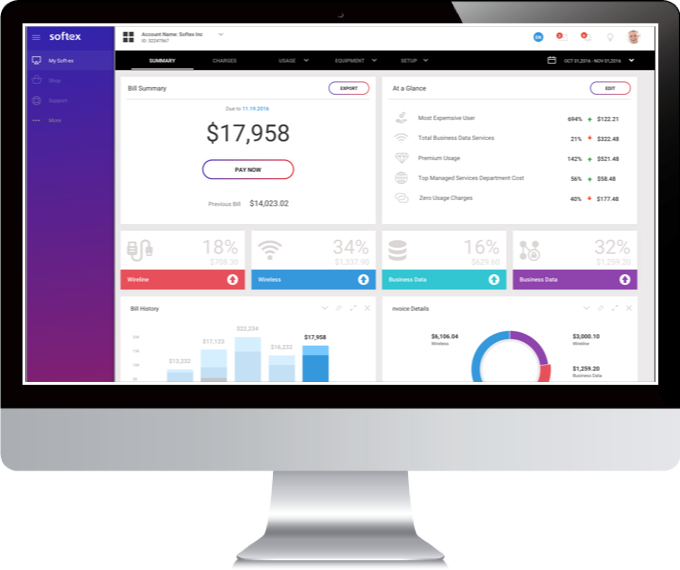 Soft-ex provides an advanced user experience interface which enables the DSP to provide unified visibility on one or multiple bills via a fully transparent and easy to navigate portal. Soft-ex assists the DSP to optimize customer online engagement and enhance the customer experience with personalized billing, while delivering significant savings and efficiencies in billing costs and customer care. Not only do customers expect complete transparency and the ability to see their bills online, they also want to be able to compare bill trends, see which departments are spending most, what voice and data is being consumed. They also want to view their devices and what data or managed services excesses they have. All of this can be made available through self-serve graphical reports and easy to understand analytics. DSPs can even use our platform to deliver notiﬁcations and observations based on usage and preferences. Telcos themselves also need agile intelligence on their customer base. For years robust CRM & BI systems have existed in the DSPs infrastructure, but getting the customer data as and when the telco management or account team need it, has always been a challenge. With Subscriber Data Intelligence from Soft-ex, DSPs will be able to better engage with their customers to offer new and customized services to each of their customers. Furthermore the Sales & Marketing teams of the DSPs will be better positioned to understand the customers’ needs and be more proactive in terms of optimizing service offerings, especially in the run up to contract renewals. B2C eBilling is much more simplified compared to the complexities of B2B data feeds and analytics. Key here is to present a simple, easy to navigate portal, with all the relevant billing information at your finger-tips. Personalizing the billing experience with on boarding messages and notifications help avoid bill shock and reduce the number of calls to care centres. We also deliver targeted profiling and relevant banner advertising as part of the solution, to upsell and cross sell new services, which leads to increased customer loyalty and retention. Soft-ex delivers innovative digital bill presentment solutions for large enterprises and government organizations. When dealing with larger corporate and government accounts, DSPs need to offer 24/7 centralised visibility on billing but also need to be in a position to allow the enterprise to self-serve and carry out drill-down analytics and cost allocations on their expenditure. Soft-ex has widespread expertise in leveraging and consolidating complex and multiple billing platforms to facilitate detailed reporting across global organizations, right down to individual user level. "Approximately 80% of all calls to the DSP’s call centre relate to the bill. Our customers see reductions of up to 40% on these inbound calls, which makes for a significant cost saving"
Soft-ex has a long-standing track-record for delivering Value-Add Services to the Enterprise clients of DSPs around the globe. The latest RingMaster release offers a completely new and innovative user interface with a widget driven dashboard delivering enhanced analytics, navigation and user experience. The solution will deliver granular visibility and billing insight on performance, infrastructure and costs to enterprise and public sector customers of Soft-ex’s key channel partners such as BT, KPN, eir, & Capita. RingMaster Version 6 integrates with all major UC platforms such as Cisco, Microsoft, Avaya, Broadsoft, Unify and Mitel. We deliver our applications to fit any business model (on-site, managed service or SaaS) for mobile, fixed, VoIP and data. If you would like to learn more about our innovative solutions and how we can assist your company to reduce churn and increase customer loyalty, then simply contact us today to schedule a demonstration.